The rare Australian rainforest tree Ryparosa sp. nov. 1 aff. javanica (sensu Webber & Curtis, BW-017; Achariaceae) has large fleshy fruits that undergo a distinctive colour change during ripening. Fruit seem highly suited to frugivore interactions with large ground-dwelling avian or marsupial frugivores, a role primarily filled by the endangered cassowary. We found that fruits had chemical defence traits that closely paralleled morphological ripening signals. Young fruit seeds had amongst the highest concentrations of plant tissue cyanogens ever recorded (some in excess of 12 mg g-1dw), yet the flesh of ripe fruits had negligible cyanogen defence. A seed treatment trial found that cassowary gut passage significantly improved germination from 4% to 92%, and we were not able to replicate this result with simulated treatments. 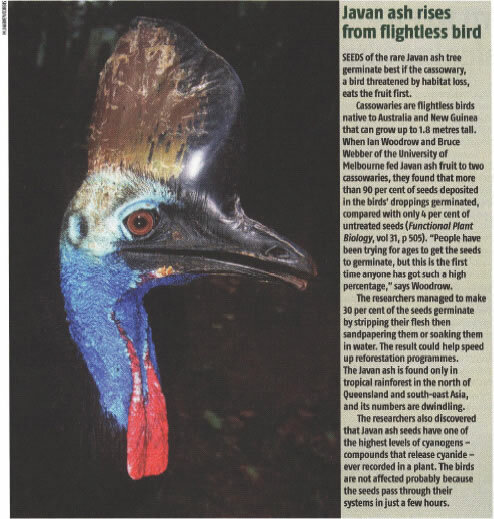 While high levels of fruit fly larval infestation accounted for reduced seed viability, this predation was apparently reduced by cassowary gut passage. Post-germination seedling traits such as haustorial cryptocotylar cotyledons and epigeal germination may increase the chance of survival for established seedlings. We conclude that the range of traits seen in Ryparosa recruitment is particularly suited to interactions with frugivores and survival in a rainforest ecosystem.